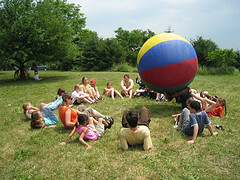 Free Spirit Nature Camp is located at 21 Keziah Lane in Westtown, New York on the Kezialain Organic farm. The 200+ year-old Lain Family farm offers 160 expansive acres of extraordinary hilltop views, woodlands, shady groves, ponds, streams, barns, gardens and fields to invite exploration and discovery. Each camp group has its own outdoor meeting place. A play area with wooden tower and swings is nestled into the edge of the woods by the creek. A converted barn offers shelter on rainy days. Easily accessible from Unionville, Greenville, Port Jervis, Middletown, Warwick, Pine Island, Florida, Chester, Sussex, and Wawayanda. Anthony Donovan, a longtime friend of the farm, created this 10 minute video about the Lain Family and their land.